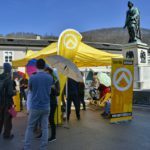 On Saturday, March 30, 1919, the „Identitarian Movement“ (IB) on Mozartsplatz built up an information booth. The IB represents patriotic thoughts. „We stand for a world of diversity of peoples, tradition and cultures. Every people is right to homeland. However, several links organizations see the identities as right-wing organizations and called for counter-demonstrations. The protesters should bring umbrellas to prevent the view on the information stand of the IB. To prevent possible riots several police police cars were present. Often identities and counter-demonstrators entered into discussions and exchanged their thoughts. Here true democracy was proven by both sides!